Marriage is a union of two souls and family who make sure to be there through the thick and thins of each other. There are so many responsibilities and commitments that are expected and fulfilling them with perfection and smile on the face is really difficult. However, as a newlywed, it was all due to my Mom and her valuable teachings that helped me sail through all and that too with utmost poise and grace. Here are a few things that should in mind of al newlyweds.. I was the lazy daisy before marriage but my mom, on the other hand, was always on her foot and was doing something or the other. No matter how much we used to persuade her to sit with us but she always would find some work that would need her attention. This really helped me in managing my home in a much better way and responding to the needs of the family members or kids or husband in a much smoother way. You should be able to entertain guests and call them over for some good food and deep conversation or just a casual potluck party. It helps you to grow as a better person and brings so much happiness and zeal at home. It’s a way of learning so many things and spending your time positively. I have always seen my mom compromising whenever there was the need. This is the best ingredient for a happy marries life. Put your partner before you do not sympathize rather empathize and also help your partner to do so and this will surely help your relationship to grow and evolve. My mother taught me this and putting your partner before you show your love and this helps you in the long run. 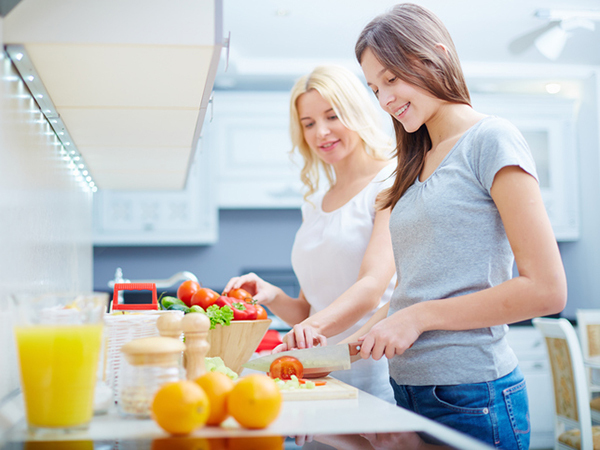 Well, one can always hire a cook or eat out or opt for the tiffin service but making good and healthy food for your family will definitely help you in relaxing and rejuvenating. The feeling of feeding your family with food that has been cooked with love is incomparable. Rather my mother used to have the kids and also other members to help her cook an elaborate meal for the family so that we could simply bond over the food that we were cooking and also have fun. She passed on the secret family recipes and some cooking hacks that truly helps me to be a better cook and flaunt my talent. My mom was always there to help us or to listen to us in spite of being super busy and this truly helped us grow as a better person and much more confident as we had a sorted childhood and the same thing I do with my kids so that they are confident and also have my guidelines for various matter.